Intense competition flares when the old established firm of Holroyds finds itself challenged by a rival funeral director who has set up shop almost on their doorstep. As chaos descends over the corpses, coffins and cremations, it transpires that the new business is really a cover for a cannabis smuggling operation. Then, things really start going to pot!! Bearing in mind their history, it was probably the subject matter of this tasteless, would-be comedy which appealed to Hammer. It cannot possibly have been the television series on which it was based, which could hardly be described as popular given that only six episodes (plus a pilot) were ever made by the BBC! 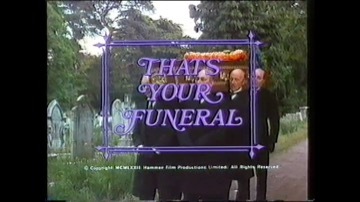 The film’s main interest now is that the opening titles include shots of the production crew behind their credits.This is comedy actor Eric Barker’s last film appearance. His awkward gait, by the way, is not put on, but is the legacy of a stroke he had suffered some years before.This also marks Michael Ripper’s last appearance in a Hammer film.